Cracks, pops and bangs pierced the warm fall air Wednesday in Birchwood beneath a brilliant sun. Ted Smith would have liked the sound. The sunshine? Not so much. 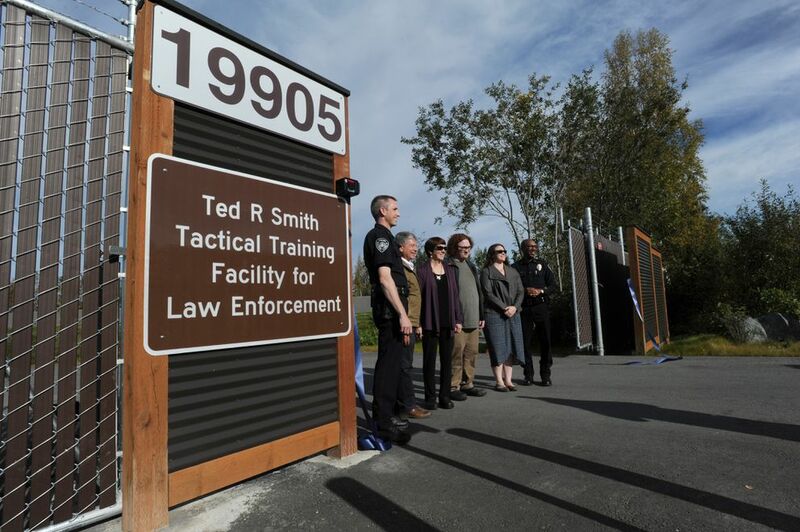 "The worse the weather was, the more he liked it," said Anchorage Police Department Chief Justin Doll during a ribbon-cutting ceremony for the new Ted R. Smith Tactical Training Facility for Law Enforcement. "That was really interesting if you were a student." 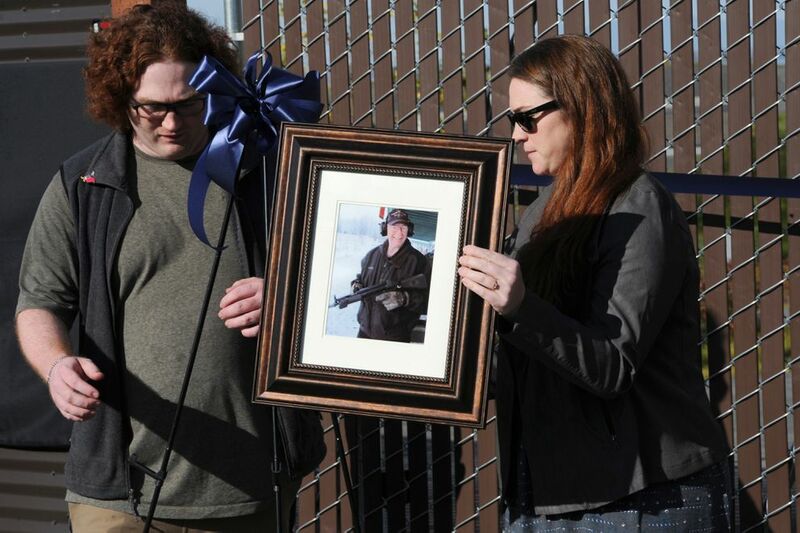 "He loved anything you could fly, drive or shoot," his family wrote in Smith's 2013 obituary. "And anything he loved, he became certified to teach or fix — pilot, flight instructor, scuba diver, gunsmith, mechanic, emergency medical instructor, biker, and firearms instructor." Smith's wife, Barb, and children, Amy and David, were on hand to help officially open the range. Barb Smith said her husband "would have loved this range." "He shared with Anchorage police, he shared with state troopers, federal agencies, the military — especially our deploying troops — and civilians," she said. "His passion was having us all prepared and just assuring we would all go home safely at the end of the day. He so would have loved playing here — it's just a wonderful facility." The recently completed facility that bear's Smith's name was more than a decade in the making. According to APD spokesman MJ Thim, the 22-acre facility was funded with a trio of state grants totaling $8.2 million secured between 2012 and 2014. In 2015, the Municipality of Anchorage purchased the land from Eklutna Inc. for $1.95 million. 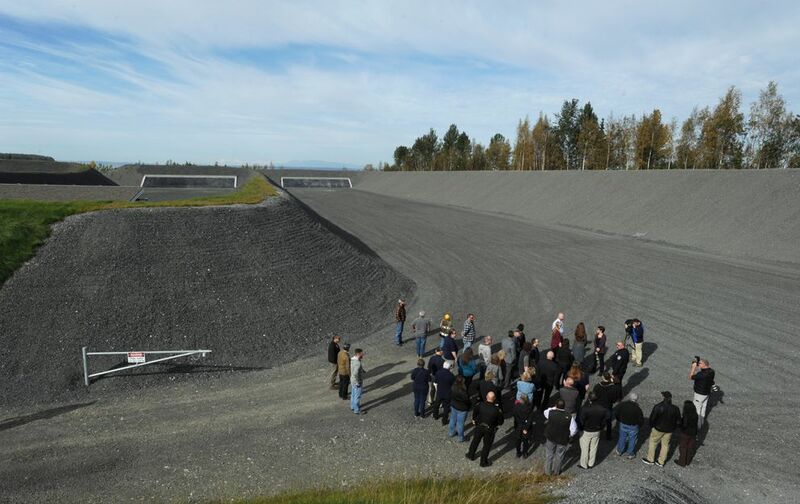 Last August, Anchorage Public Works director of maintenance and operations Ted Czajkowski told the Alaska Star construction was expected to cost about $4.6 million, with another half-million for design work. 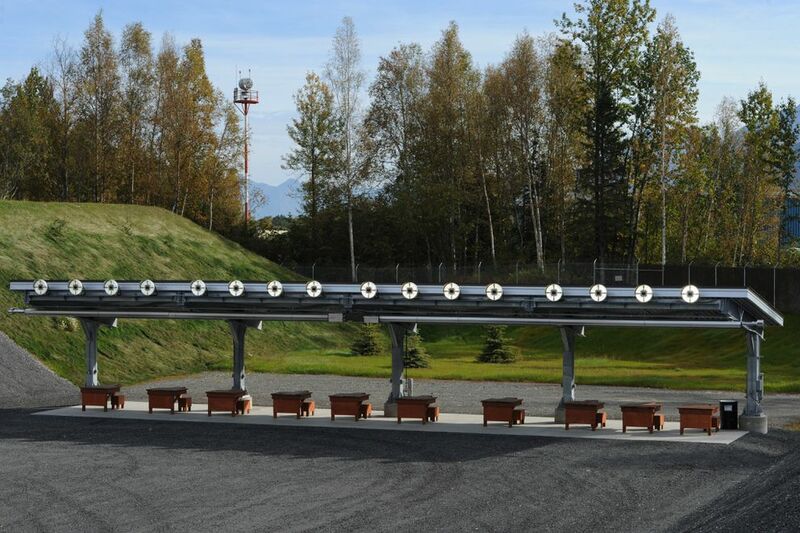 The facility — adjacent to the Birchwood Recreation and Shooting Park and across the street from the Birchwood Airport on land overlooking Knik Arm — includes 300-, 150- and two 50-yard ranges as well as a 2,208-square-foot operations building and paved parking lot. It also includes 40 benches built and donated by members of the APD Citizens Academy Alumni. 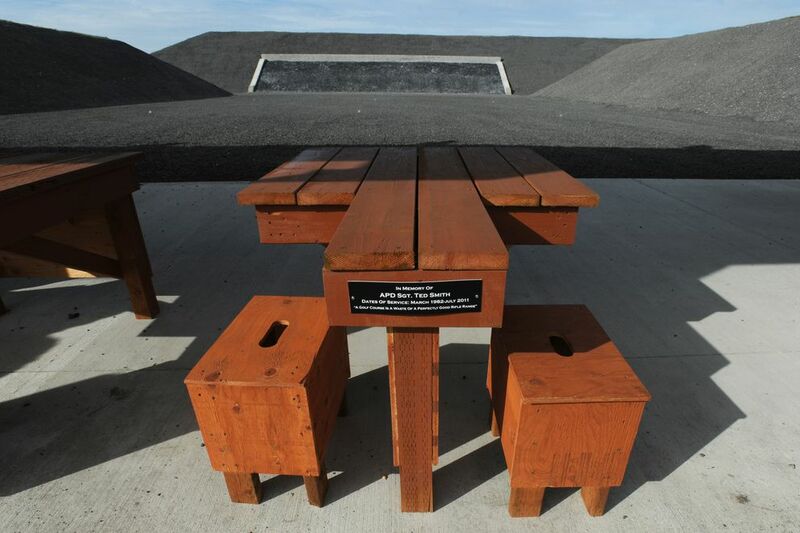 Thim said the benches took six weeks and more than 300 hours to build and were made possible because of donations by the academy, individuals and the Alaska Peace Officers Association. One of the benches is dedicated to Smith and includes a plaque featuring a quote from the retired sergeant, who served from 1982 until retiring from APD in 2011. "A golf course is a waste of a perfectly good rifle range," reads the inscription. Anchorage Mayor Ethan Berkowitz said the "world class" facility marks a major advance in the department's training capabilities. "We ought to aspire to excellence in everything we do and this facility measures up to that," Berkowitz told the dozens of police officers who joined Smith's family and friends for the midday ceremony. After the ceremony, guests were given a tour where Lt. Richard Henning showed off some of the features — including adjustable lights along the range and heaters above the firing line. 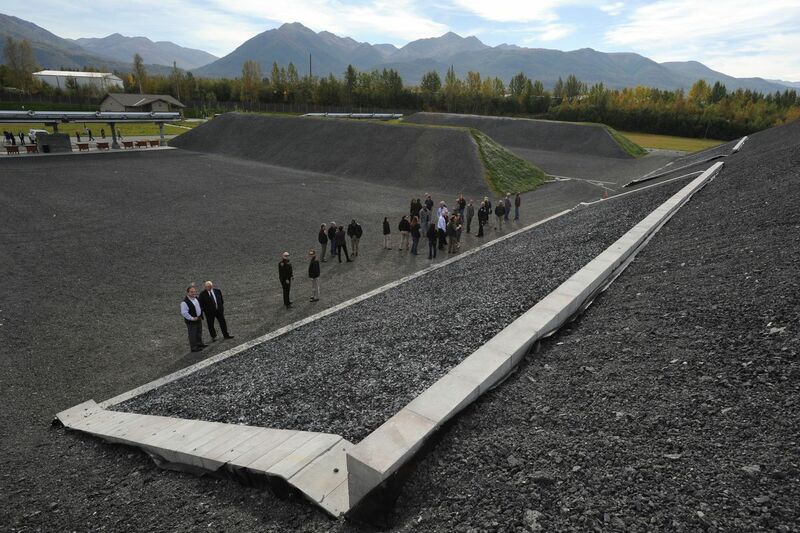 The target areas are concrete-faced with rubber and the ranges themselves are constructed of asphalt reclaimed from the Glenn Highway. APD officers previously trained at private shooting ranges such as the one adjacent to the new facility. Chief Doll said having a dedicated law enforcement range near Anchorage will benefit not just his agency, but all law enforcement in the area. "From zero to this is a pretty massive step-up," he said. "We never had our own outdoor range. So having this facility available is huge. It's huge for APD, it's huge for all the other law enforcement agencies that operate in Southcentral Alaska." Doll said the range will be used not just by APD but by the likes of local police forces, the Alaska State Troopers and the FBI. "If you think about it, it really enhances the team-building and the joint operations that we do all the time to have someplace like this that we can share and train at together," he said. That's something Smith would have definitely approved of. His dedication to training was legendary, and Doll credited Smith with installing much of the curriculum and exercises still used by today's officers. "Ted strove to be excellent in everything he did."